Genre: 2D Platformer. Other versions: PS. Evil, vengeful, child-hating witch Nilam has struck a potentially fatal blow against the combined forces of goodwill and commercial opulence by spiriting Dr. December himself, Father Christmas, away into a magical (pushing it a bit), dangerous world. Said environment is the basis of a rather vapid 2D platformer, where Santa must survive fifteen levels in order to escape and by extension, though the reasons are never really elaborated on, save the Earth as well. 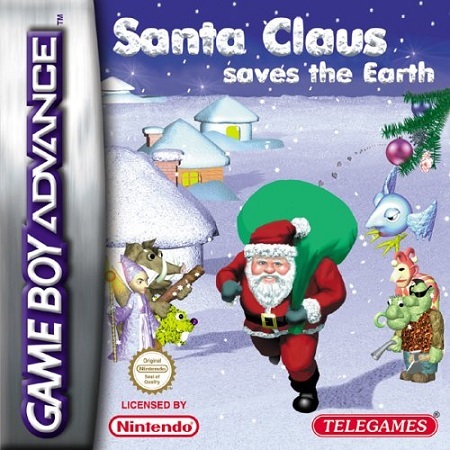 Santa Claus Saves The Earth is not without the occasional flash of gameplay, but it feels more like a late-eighties bargain bin release than a bonafide 21st Century handheld effort. To describe what transpires as old-fashioned would be phrasing things very kindly though, as you’re subjected to an often-dreary pilgrimage through sparse, cavernous labyrinths populated by ladders, winches, unsighted spike pits and a strange mishmash of enemies, in a scenario that comes nowhere close to recapturing the dynamism and fun of the early Mario and Sonic adventures. For starters, it’s frightfully ugly. The title screen sets a monstrous precedent, and in-game it is defined by spirit-crushing levels of sparsity and endless grey stone walls, along with some utterly incongruous scenic adornments. These include, among other things, large extractor fans, grandfather clocks, and that most Christmassy of mise en scene, framed pictures of clowns. It’s as if Ivolgamus used the threadbare properties of a previous ill-fated venture and bunged everything into the design cauldron, regardless of its cohesiveness. There's copy 'n' paste and there's WOAHWOAHWOAHWOAH! Or, if you look at things the other way round, you could very well imagine the ‘play as Santa’ idea being proposed as an eleventh hour epiphany intended to bestow short-term marketability on a largely irredeemable game. The case for the prosecution is ably made by the enemies, as you’re assaulted by weird, rabid yellow dogs, oddly shaped men with pistols, what might pass for torch-wielding hog-men (at a guess) and blue flying… things. I think you’ll agree: all very festive. Each resembles their own individual design tragedy, and all appear to share the same nasty sound effects. Next on the mental menu is the music, and for once, not entirely for the worse. There was evidently at least one programmer hell bent on stamping a creative streak on Santa Claus Saves The Earth. Admittedly things start badly, with an off-key reworking of “Jingle Bells” fairly assaulting your ears on the title-screen, but what follows is a surprisingly engaging, chirpy array of tunes which are generally a lot more lively than the game itself. There's even the odd funky bassline and toe-tapping drum beat to get things moving. Granted, they’re insanely repetitive, but the trance explosion and hilariously simple red/blue strobing effect that’s greeted by one of Santa’s power-ups is a genuine “so bad it’s good” moment. Three bosses make an appearance, and they get steadily worse. If you’re in possession of powerful items, the clown, who’s chief ability can best be described as “striding back and forth with a degree of purpose”, should be a piece of cake. The second boss distinguishes himself through significantly more aggressive walking, and the unfortunate tendency to jump on Santa and lay into him with a big axe. Perhaps inevitably, this is the cause of a significant amount of aggro; I know we all like a drink or two at Christmas, but this is taking things way too far. Events build to a soaring crescendo of embarrassment in Santa's final conflict with Nilam. The witch skilfully twins the deadly arts of medium pace side-to-side walking and short range gliding. More pressingly, she has the annoying ability to deflect snowballs, tomatoes, insults, and whatever else you might choose to throw at her, so you’ll end up finishing the game in the most ignominious way imaginable, bouncing around trying to clobber her in the head with Santa's sack. Ho Ho Ho! “It’s Christmas though, there must be some positives to be found!”, I hear you weep. Well, whilst his general ambling is rather sedate, Santa is at least relatively responsive to control inputs. If you appreciate a challenge, then the need to locate keys, traverse spike pits and expose the odd false wall will keep you on your toes, and the lack of checkpoints can mean a number of the levels require a good bit of graft to conquer. There's no denying the game chucks a lot your way between the beginning and the end of each level, and there's plenty of gameplay in the traditional sense, even if it isn't very good. But whilst you may need to tough it out for a few days in order to beat the game's fifteen levels, there's essentially zero incentive to return. Oh Santa, what have you done to deserve this? SCSTE is a real Christmas turkey. In fact, it isn't really a Christmas game at all, just a really low-rent, ugly, outmoded platformer with a few hasty adornments added to cash in on during the festive season. There's no point saving the Earth at the expense of your wallet or your dignity, and this is one adventure that's best left to the archives.